Current Cleveland Browns players seem happy Freddie Kitchens will be named the franchise's next head coach. 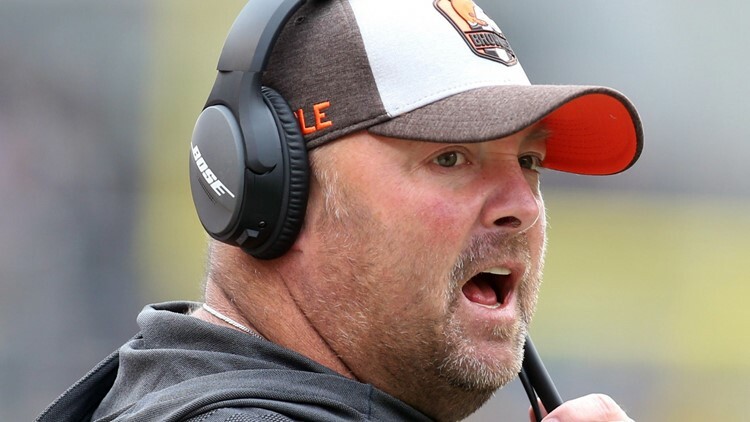 CLEVELAND — Reportedly, the Cleveland Browns are set to hire interim offensive coordinator Freddie Kitchens as their next head coach, and as the news made the rounds on social media Wednesday, so did the reactions to the move. And some of that reaction came from within the Browns’ locker room. Rookie linebacker Genard Avery was among the first players to respond to the reports of Kitchens being selected as the new head coach of the Browns. Defensive lineman Christopher Smith soon followed by extending his congratulations to Kitchens. Kitchens will be the 17th full-time head coach in the history of the Browns organization and the ninth since the team returned to the National Football League ahead of the 1999 season. Kitchens was interviewed for the head-coaching vacancy on Monday, and made quite the impression, so much so that the search committee chose him from a list of candidates that included six others with various coaching experience in the NFL. Kitchens’ elevation to head coach caps an unusual 12 months for the well-traveled assistant. In addition to Kitchens being selected as the Browns’ next coach, it was reported that interim coach/defensive coordinator Gregg Williams was relieved of his coaching duties and no longer with the franchise. That prompted a quick response from former Glenville High School/Ohio State/Cleveland Browns standout defensive back Donte Whitner. At 2-5-1 following a 33-18 loss to the Pittsburgh Steelers on October 28 and in the middle of an unprecedented midseason coaching upheaval with eight games remaining on the schedule, the 2018 Browns looked to be anything but a team capable of the greatest year-to-year turnaround in franchise history. However, Williams led the team to a 5-3 record over the second half of the season and a three-game winning streak in December secured the Browns’ greatest turnaround in franchise history, as they finished plus-7.5 in wins over last year’s winless campaign.